In 1852 the Reverend Mr. Robert McCachran erected a four story brick building just east of Newville, Pennsylvania along the Big Spring and there established Linnwood Academy. He was assisted by Professor William Linn, who later succeeded him as headmaster. The academy was a classical school for boys which was later opened to girls. During the Civil War the Confederates who came into Newville searching for supplies used the shady grounds to stake out and graze their horses. In the early 1900’s Dr. And Mrs. George Hursh remodeled the house inside and added the sun porch on the west. Since then Linnwood has been used only as a residence. Mute evidences of the past are the initials carved into the floors of the third floor rooms which appear to have been used as dormitories. The initials S.P.K., Dec. 25, 1873 are scratched on a windowpane in the living room, and the name W.B. Denning and some less legible names are scratched on a windowpane in the kitchen. Old Newville newspapers record that a favorite pastime of the young folks of the community before 1900 was picking violets on Linnwood’s lawns. Parties were organized for just that purpose. Some of the forest trees left standing when Linnwood was built are still there and many new ones have been planted. 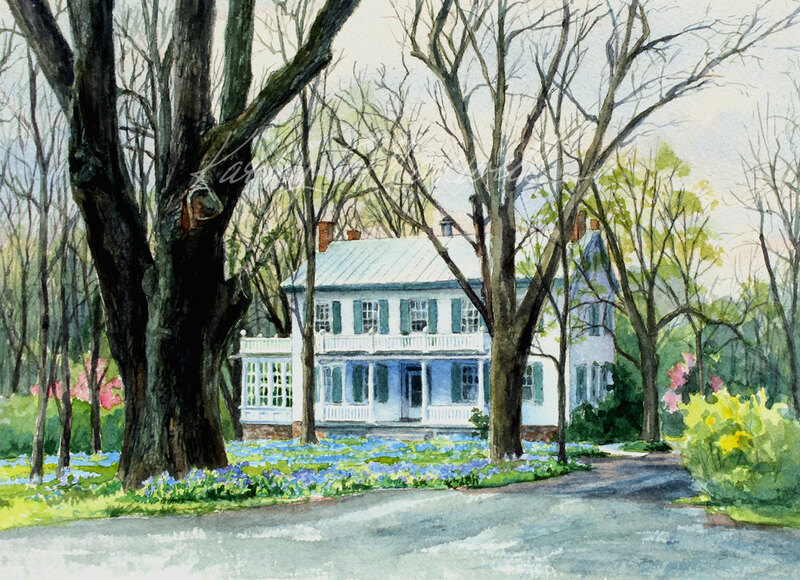 After Guy and Betty McElwain purchased the property Guy planted three bluebell plants which in more than forty years have spread throughout the front lawn.